Patrick Laughlin completed his solar training in Bloomington two years ago. He's now working as an installer in Colorado. After the training, the 31-year-old received four jobs offers and moved to Colorado, where he installs solar panels on homes. “It was definitely a big move. But it did pan out well,” Laughlin said. Laughlin is one of thousands of workers who’ve benefited from a solar energy boom in the U.S., fueled in part by government incentives and falling technology costs. The number of solar photovoltaic installer jobs is expected to more than double between 2016 and 2026, according to the U.S. Bureau of Labor Statistics. In Central Illinois, the industry expects to add more jobs later this year as utility-scale solar farms are built. Dozens of solar farm projects are pending in McLean County. 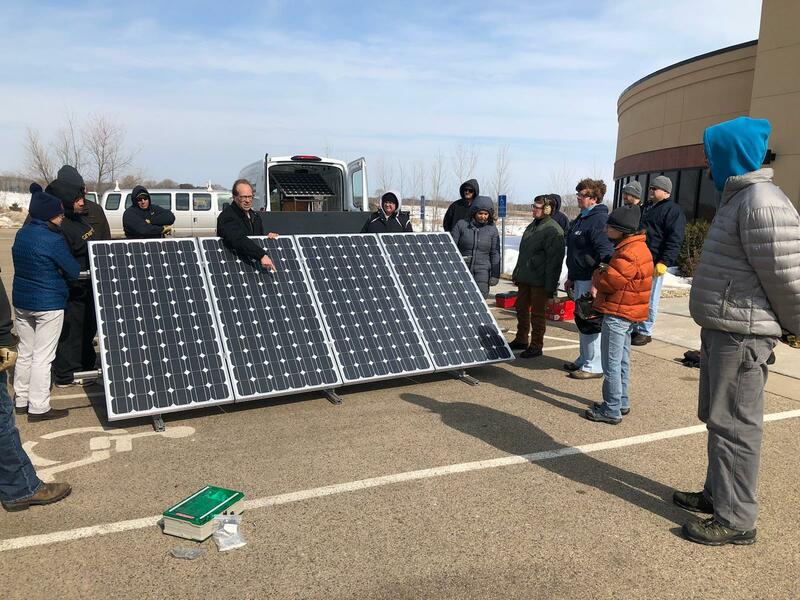 Trainees do some hands-on training at a Midwest Renewable Energy Association solar academy in Minneapolis-St. Paul, Minn., in 2018. 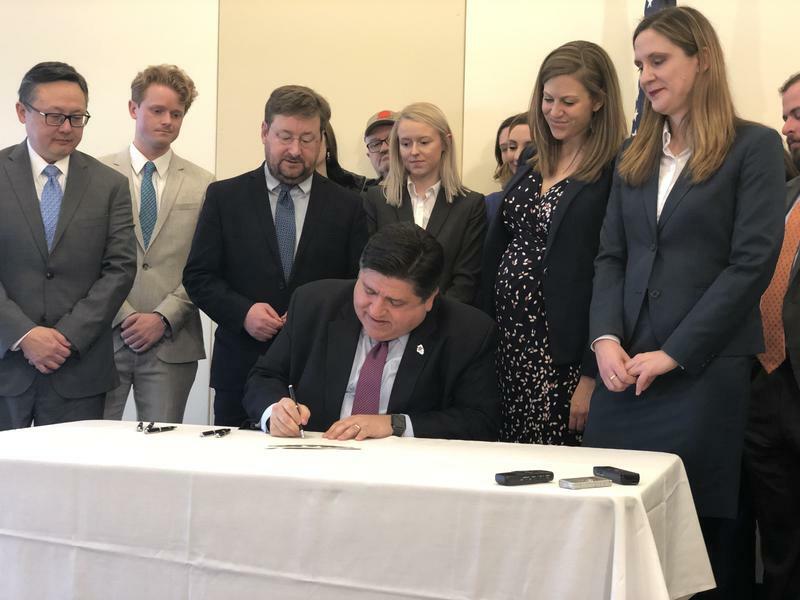 Much of that growth traces back to the Illinois Future Energy Jobs Act, which went into effect in 2017. It’s considered one of the most significant pieces of energy legislation ever to pass the Illinois General Assembly. It requires that Illinois procure 25 percent of its power from renewable energy sources by 2025. It also sets aside $30 million to develop clean energy-related job training programs over the next 12 years. “There will be a lot of installation going on, which in turn creates the workforce demand. It’s a really exciting time in Illinois,” said Julie Brazeau, regional training coordinator for the Midwest Renewable Energy Association (MREA). Laughlin, the solar installer, attended an MREA solar training academy in Bloomington. He commuted to the weekend courses from his home in Fort Wayne, Ind. Another round of MREA training began Jan. 19 at Illinois Wesleyan University and will run through March. Trainees learn about basic photovoltaics (PV), PV site assessment, and PV system design, including hands-on experience in low- and high-voltage labs. Bloomington-Normal is a good fit for the program, said Alex Jarvis, owner of Indiana-based installer Solar Systems, who is leading the Twin City MREA training. The attendees are a mix of young people looking to make a career change, trades workers looking to expand their skillset, and even graduate students, Jarvis and Brazeau said. Twelve people are going through this spring’s MREA training in Bloomington, said Brazeau. Without training programs like MREA’s, contractors trying to meet solar demand would have to train their workers themselves, which costs time and money, she said. MREA isn’t the only place to get solar training. Heartland Community College’s renewable energy certificate program prepares students to be certified to install and maintain solar panels. Kankakee Community College offers a solar-photovoltaic certificate and specialization track in its electrical technology program. Advocates say the demand for trained workers is there. In Illinois, there are already around 3,500 solar jobs, according to the Solar Energy Industries Association. The amount of solar capacity installed in Illinois is expected to grow by more than 1,700 percent over the next five years, the SEIA reported in December. The median annual wage for solar photovoltaic installers was $39,490 in May 2017, or around $19 per hour, federal labor data show. That rings true with the average starting pay of $18 to $20 an hour that Jarvis has seen offered to new trainees. That passion can help once you’re on the job installing solar panels. Laughlin works four 10-hour days every week, often starting at 6 a.m., for Namaste Solar in Boulder, Colo.
“It can be a long day,” he said. The job can be physically demanding and mentally demanding because you’re on people’s roofs. It’s this mixture of danger from your environment and hazards with what you’re working with. Twelve people are going through this spring’s Midwest Renewable Energy Association training in Bloomington. Solar panels have been popping up on McLean County home roofs for years. MREA and the Ecology Action Center teamed up again last year for a solar “group buy” that made it cheaper for homeowners and business owners to install solar. The next wave of solar jobs could be on a much larger scale. Several national developers have already won initial approval for 18 different solar farm projects in rural McLean County. Those developers are now waiting on the results of a lottery that will determine who gets renewable energy credits—the incentives that have helped make Illinois economically viable for solar. That application for those credits opens Jan. 30, and the lottery is expected by mid-March. It’s not clear which, if any, of those projects will get the credits or proceed to construction. But each project that moves forward will employ around 15 electricians for three to four months, said Michael Raikes, president and membership development director with the International Brotherhood of Electrical Workers (IBEW) Local 197 based in Bloomington. Solar projects were already a growing source of work for union electricians, Raikes said. Wilcox Electric, a leading solar installer in Bloomington-Normal, had 1,000 man hours completing solar projects in 2018 and are on pace to double or triple that in 2019, Raikes said. A big solar project for Olympia school district in 2018 employed 12 electricians for three months, he said. “We encourage those (solar farm) projects. It’ll employ local workers and local contractors. That money will just re-distribute to our entire community,” Raikes said. IBEW has recently expanded its solar and green energy curriculum within its five-year apprenticeship program, said Raikes. Laughlin, the solar installer in Colorado, said that to advance in his career and demand more money, he’ll need to accrue certifications in the electricians’ trade. He said he wished he would’ve known that during the MREA training. Jarvis, the trainer from Indiana, said the MREA training is still a good first step into the solar business, regardless of where you’re headed. “The same tenets apply to whether you’re putting up 10 modules, or 1,000 modules. A lot of the basics, in terms of compliance with the code and ampacity and voltage requirements, those are all kind of the same,” Jarvis said. An international panel on climate change this week warned greenhouse gas emissions will keep increasing if left unchecked and called for urgent action. According to one Illinois scientist, that means frequent heavy rain events and flooding could become the norm.